This geek list is designed to let players vote for the favorite TWENTY aliens. This is a pretty long list, so look over everything before you start voting with your "thumb". This voting is not official, but will at least provide some guidance and trending data for others to look at. While the list is long, I know there are tons of other alien ideas still floating around out there... nevertheless, this list represents aliens that have gotten some amount of traction, or if nothing else, have been playtested numerous times I know of. You have the power to Triumph. At the start of your turn, if you have any foreign colonies, use this power to win the game. You may still win the game via the normal method. Other players may have an encounter at one of your foreign colonies whenever the destiny draw allows them to target either your home system or the system that hosts that foreign colony. Crack shots, daring pilots, and epic swordsaints, the legendary Aces require only the most trivial of opportunities to achieve total victory. Fearfully hunted to presumed extinction, only a few hidden Aces survived the cosmic purge. Now reinforced by a handful of converts and grown children, they hope to fortify one secret base and take the galaxy by storm. WILD: As a main player, after encounter cards are revealed, if your opponent is not the Ace you win the encounter. Give this flare to the Ace after use (or discard it, if the Ace is not playing). SUPER: As the defense, if you lose the encounter, instead of sending your defending ships to the warp you may relocate them to any one other planet in a different system to establish a colony there. Afterwards, discard this flare. You have the power to Fish. As a main player or ally, before encounter cards are selected, you may use this power to ask any player on the opposing side if he or she has a specific card, such as an attack 12, a regular negotiate card, or the Virus flare. If that player has the card, he or she must give it to you. Otherwise you must draw a card from the deck. Developing on a monaquatic homeworld filled with untold prey species, the Anglers learned patience, stealth, and selectivity – disciplines that serve these passive predators well as they now take to the stars. Assessing the aliens they encounter and luring carefully selected victims to an early demise, the Anglers often reel in valuable spoils to satiate their growing needs. WILD: You may name a specific card and look for it in the deck. If you find that card, show it and add it to your hand. If not, you must take one card from the discard pile by majority vote of the other players (you break ties). Reshuffle the deck and give this flare to the Angler (or discard it, if the Angler isn’t playing). SUPER: If you receive the card you asked for (from the other player or from the deck), you may use your power a second time during this encounter. You have the power to Arm. At the end of each encounter, any reinforcements played by any player are placed face up on this sheet, instead of being discarded. Cards on this sheet do not count as part of your hand. Each time you add one or more reinforcements to this sheet, you must give one reinforcement already on this sheet to any other player (if there is one). As a main player or ally, once per encounter, you may use this power to discard any non-encounter card from your hand. When you do, add the value of all reinforcements on this sheet to either side's total. The ancient race of Armorers are well known for being able to turn anything into a weapon. They work in silence and seclusion, fashioning the latest instruments of destruction. However, in recent times, the Armorers have become less and less willing to share their dangerous wares, stockpiling them instead for their own use. Only when they must make room for new arms will they grudgingly make munitions available to those who are worthy (or pose little threat). WILD: You may discard an attack card from your hand to add to one side's encounter total, counting only the first or second digit of the card. SUPER: You may use your power to arm as many times as you wish in an encounter. You have the power to Merge. 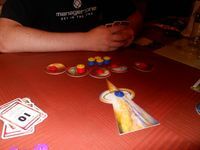 As a winning main player, at the end of the encounter, you may use this power to merge two planets. Choose any planet on which you have a colony, and any other planet in the same system. Stack the two planet discs. Place all ships from both planets on the merged planet. The merged planet counts as one planet. A merged planet may not merged again with another planet. If you choose not to merge, you may use this power instead to spin off an already merged planet into two normal planets. The planets stay in the same system. Arrange the ships on the two spun-off planets any way you wish. The denizens of Blob have advanced their techniques of metaphysics and corporate law to a degree unknown by any other race in the Cosmos. Now they're about to execute a hostile takeover, using contracts to reshape entire planets. WILD: When you are the defense, choose any player's ship on a planet where you have a colony. Send that ship to the warp, and replace it with one of your ships from another colony of your choice. SUPER: After you use your power, play this flare to use it a second time. You may repeat the same action you just did, or follow a merger with a spin-off if you like. You have the power to Marry. As a main player, before alliances, you may use this power to marry your opponent by forcing that player to give you one of his or her ships from any colony and placing it on this sheet. You may only be married to one player at a time. Spouses may ally with each other without being invited, show each other any cards in hand, and trade cards at will. At any time you may divorce your spouse. Turn that player's ship upside down on your sheet. You may not remarry a player you previously divorced. If you lose your power from having too few home colonies, you must divorce your current spouse. The Brides have left a trail of broken circulatory pumps and legal hi-jinx across the cosmos. And yet the allure of the Brides is impossible to resist. The Brides, however, eschew the social pressure of the present and reject wallowing in the past as they drifts through space longing for a fantasy future with their true soul mate, be it a low life Hate or a noble Ethic. WILD: As the defense, you may run away from an encounter. The offensive player's turn ends and play passes. SUPER: You may remarry a player you previously divorced. Turn their ship on your sheet face up. You have the power to Muddle. When you are not a main player, each player who invites you to ally may invite you to join his or her side, the opposite side, or the side of your choice. If not invited at all, during the encounter you may get bored and move any one main player’s ship from one of his or her colonies to another. When you are an ally, before encounter cards are selected, the main player on your side may dismiss you from the encounter. If dismissed, place your allying ships on this sheet until the resolution phase, then land them on a different planet in the targeted system. As a main player or ally, after encounter cards are selected but before they are revealed, you may use this power to muddle the encounter. If you muddle, after cards are revealed your involved ships subtract from your side’s total instead of adding, and you may then discard one attack card from your hand to subtract its value from your side’s total. If your side loses, your muddling ships return to colonies instead of going to the warp and the main player on your side may not collect compensation. It is often said that the only thing worse than being alone is having the Bungler at your side. Never has a planetful of would-be bodyguards been so willing and yet so clueless. Charging the lowest rates in the Cosmos and doing their best to stay ahead of their reputations as unpredictable oafs, they attract plenty of new customers – but little repeat business. With allies like the Bungler, who needs enemies? WILD: As a main player or ally, after encounter cards are revealed, you may cause your side to lose the encounter. 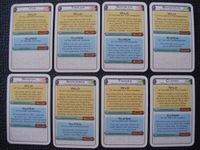 Your involved ships return to other colonies and you decide whether each main player keeps or discards his or her encounter card. SUPER: If you are not dismissed, you may bungle the encounter after encounter cards are revealed. You have to power to Dance. As a main player, instead of playing an encounter card, you may use this power by saying to your opponent, "Let's dance". You place 3 cards from your hand face down in front of you, then turn the first card face up. You opponent must then play a card face-up from his or her hand. If your opponent’s card matches the type of card you played, repeat the process with your second and third card. You opponent must play a card from hand for each card you reveal. 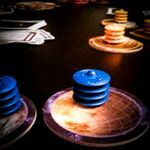 If your opponent is unable to match all three card types in the order you played them then you immediately win the encounter, but your opponent does not lose ships (they remain on the planet, or return to other colonies). Otherwise, you lose the encounter. Discard all cards used in the dance. An avian species whose elaborate mating displays soon consumed all aspects of their society. Upon hearing radio signals from the Siren home system, they become aware that a greater stage awaited them in the universe. Now they seek a hoedown with all other beings in an effort to find the perfect two-step, but given the number of organisms with two left feet or no feet at all it remains to be seen if the universe can keep time. WILD: You may declare that two encounter cards must be played facedown. When revealed, attacks are added together. If either is a negotiate, they both count as a negotiate. If your opponent only has one encounter card, he or she only uses one. SUPER: You may extend the dance to include more than three cards, but must play them facedown all at once when you declare a dance. You have the power of Risk. As a main player, after cards are revealed you may use this power to discard an attack card valued between 01 and 10 from your hand and subtract that amount from your side's total. If your side wins by 3 or less, each player on your side draws cards from the deck equal to the number of their ships involved (in addition to any normal rewards). Preferring an uncertain but exciting existence to predictability, Daredevils thrive off adrenaline, even that of others. Danger elevates the Daredevils' abilities, and their allies either rise quickly or fall hard. For Daredevils, the closer the shave, the bigger the rush. WILD: If you are not involved in the encounter, you may draw a card at random from either main player's hand. If you draw an attack card, it is added to that player's total. Otherwise, you may either keep the card or discard it and draw a card from the deck to add to your hand. SUPER: Your side gets to draw cards if you win by 6 or less. You have the power to Take In. Place all of the extra powers you have facedown. They are not considered in the game. When any other player achieves three foreign colonies for the first time, use this power. That player takes any one of your extra powers (excepting any powers that state they cannot be stolen), including all facets of that power. At the start of each player's turn, choose one of your extra aliens to turn faceup (turning facedown any extra alien already faceup). An extra faceup alien counts as your alien power. Game Setup: Place one unused set of ships on this sheet (16 in a game with four planets). You have the power to Upgrade. As a main player, after winning an encounter use this power to upgrade your ships, replacing all of your ships in the encounter with ships from this sheet. As a main player or ally, each upgraded ship is worth 3 for determining encounter totals. If you replace all ships, you may initiate a new cycle and re-upgrade your ships, using your original ships as the next upgrade). Each subsequent upgrade adds two to a ship’s combat value. Wild: As a main player, after winning an encounter, you retrieve a number of your ships from the warp up to the same number you had in the encounter. Super: When using your power you may, additionally, upgrade two of your ships not involved in the encounter. Thou hast the power of Sanctimony. When thou wert neither a main player nor an ally and didst play no cards during the encounter, upon its end thou mayest use thy power to celebrate thy purity. If thou wert invited to ally by none, receiveth thee four rewards. If by precisely one, receiveth thee two rewards. If by both, drawest thee but a single card from yonder deck. And away did the Elitists secrete themselves unto their own abodes, and remained they there in feigned devotion to the false god upon which they did meditate, whilst lauding one another in their piety lest they suffer the supplications of the lesser creatures. SUPER: As a main player, after alliances are formed, if thou didst invite no allies thou mayest draw up to four cards from the deck. You have the power of Technology. As a main player, when you lose an encounter or fail to make a deal, use this power. Draw two techs from the technology deck (whether it is in use or not), and choose one to place facedown on this sheet (discarding the other one). If a tech was already on this sheet when you draw another one, choose which one to keep, discarding the other. During any regroup, if you have ships in the warp equal to or greater than the number necessary to "complete the research" for a tech on your sheet, you may move it off of your sheet. This tech is considered completed and revealed. There is no limit to the number of techs you may have completed and in play. Noted for an emphasis on conformity and utilitarian existence focused only on the necessities of life, this primary female eusocial society comes alive during crisis periods. Invaders and raiders have been stunned by counter-attacks by Engineer hives using previously unseen inventions seemingly born out of thin air. Now with the home system once again secure, the most powerful of the hives have struck out into the universe fueled by new ideas and novel interstellar propellants born from the previous dark times the race hopes to avoid. WILD: Draw from the top of the cosmic deck and keep the first artifact card you find. Discard the rest of the cards. If you run out of cards before finding an artifact, take any artifact from the discard pile. Give this card to the Engineer when you play it (or discard it if Engineer is not in the game). SUPER: When you lose an encounter, play this card to search the technology deck and put into play one card of your choosing (instead of your normal draw from the technology deck). 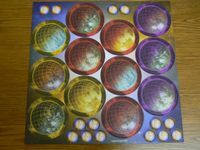 Game Setup: Choose one unused player color and place four planets of that color on this sheet. Do not use this power unless you have an unused player color. You have the power of Discovery. As the offense, after the hyperspace gate is aimed, you may use this power to take a planet from this sheet, place it in the targeted system, and re-aim the gate at that planet. As a main player or ally, after both players reveal attack cards, you may use this power to increase your side's total according to the planets you have discovered. Add 1 for each discovered planet you do not have a colony on, 2 for each discovered planet you coexist on, and 4 for each discovered planet you occupy alone. As the various child-races of the Precursors began to take to the stars, most were drawn to one another in their hunger for knowledge, trade, defense, conflict, and the other manifold needs that drove them forward. The Explorers, however, often bypassed other sentients in their haste to catalog new worlds. Even centuries later, this obsession continues; but now they begin to reap the rewards of their diverse discoveries. WILD: As the offense, after the hyperspace gate is aimed, you may take the Genesis planet (whether in use or not), place it in the targeted system, and re-aim the gate at that planet. You may receive rewards equal to your ships in the encounter if you win or make a deal, or 1 reward if you do not. SUPER: As a main player or ally in an encounter at a planet you discovered, after encounter cards are revealed you may add 4 to your side's total. You have the power to Extract. You may use this power to target one of the following areas: the cosmic deck or reward deck (if in play); one of those decks' discard piles; or one player's hand. Destroy one or more of your ships (chosen from anywhere in play) by removing them from the game. 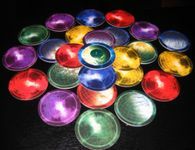 Then look through the cards in the targeted area for up to 30 seconds, take one of them, and add it to your hand. If you looked through a deck, shuffle it afterwards. You may use this power at any time, even during another game effect (e.g., to obtain a zap card to cancel an effect that was just announced). You may not extract the same card (or any copy of it) twice in the same game. The number of ships that must be destroyed to use this power increases with each successful use: exactly 1 the first time, 2 the second, 3 the third, and so on. You may invite other players to destroy their own ship(s) to help you meet this requirement. After the Extractors discovered the secret of subspace conduits, they quickly learned to pull the most spectacular heists in the Cosmos, bringing untold riches to their people. Unfortunately, repeated use of the technology weakened the fabric of space more and more, and the death toll from environmental instability escalated quickly. Fortunately for the surviving Extractors, they were able to rationalize these losses as acceptable casualties. WILD: You may choose one of your ships on any colony and remove it from the game. Then take the top card of the discard pile or the reward deck discard pile and add it to your hand. SUPER: If you invite all other players to help you destroy ships and none do, you may choose any players' ships in play to meet your destruction requirement. You have the power of Extremes. At the end of each encounter, the highest attack card revealed in the encounter is placed on this sheet instead of being discarded, as long as there is no card on this sheet, or the card already on this sheet does not have a higher value. The card on this sheet is kept face up, and does not count as part of your hand. As a main player, if there is a card on this sheet when you reveal your encounter card, use this power. If you reveal a negotiate, change it into an attack card matching the one on this sheet. If you reveal an attack card, change it into a negotiate. When collecting compensation, you must either take no compensation, or four cards, regardless of how many ships you lost in the encounter. The Extremists value quick decision making over everything. Immoderate behavior is for the lesser species, and Extremists would rather fight all out or surrender completely. There is no middle ground. WILD: As a main player, if you or your opponent reveals a negotiate but the other doesn't, you may discard a negotiate from your hand and force a deal situation. 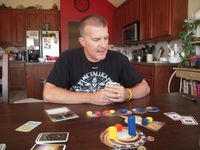 SUPER: As a main player, you may add all of your uninvolved ships on colonies to your total before cards selected. If you lose the encounter, all of your ships go to the warp. You have the power of Representation. When you are a main player in an encounter, use this power to force each ally (offensive and defensive) to play an encounter card face down. An ally without a playable encounter card must draw a new hand. After looking at the cards played by you and your allies, you select one to represent your side. Without looking at the cards played by your opponent and his or her allies, you select one to represent that side. 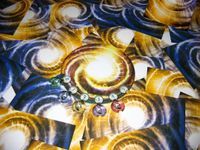 The cards that were not selected are returned to their owners' hands, and the encounter is resolved with the selected cards, as if the main players had played them. WILD: As main player, before allies are invited, you may choose to have the outcome of the encounter be decided based solely on the number of allies per side. Whoever has the most allies wins the encounter. Skip straight to the resolution phase. 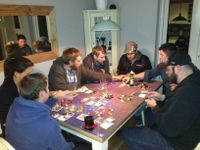 SUPER: You may look at the cards played by your opponent's allies before deciding which card will represent his or her side. You have the power to Grant Wishes. At the start of every encounter, place two tokens on this sheet. As the defense, after encounter cards are revealed, use this power to add 1 to either side's total for each token on this sheet. At any time except during your turn, any other player may make a wish that does not directly change any measure of a known victory condition (e.g., it cannot change the number of Tick-Tock's tokens, Masochist's ships in the warp, or any player's foreign colonies, but it could ask for a Mobius Tubes). If you and/or the wisher know the locations of all required resources (if any), use this power to grant the wish (up to three per player per game). Then, discard all tokens from this sheet and gain a colony in the wisher's system with up to four of your ships from anywhere in play (even if lost or captured). You may advise the retraction of a wish that you find too extreme, but if the wisher persists then you must either grant it or bar that player from all further wishing. WILD: When another player expresses a wish for the top card of the discard pile or the reward deck discard pile, you may give it to that player and collect up to three rewards. You may use this flare even if the player's wish was coerced, sarcastic, etc. You have the power to Regulate. When any player plays a Flare or Artifact, use this power to add a token to this sheet. At the beginning of each encounter, if there are at least twice as many tokens on this sheet as there are players in the game, you may use this power to discard all the tokens and establish a colony on any planet with up to four ships from your existing colonies. Otherwise, discard one token at the beginning of each encounter. Adhering to a complex and rigid social system, the Governors frown on others’ excesses. On their home worlds, anything unusual or creative was viewed with suspicion, so the Governors carefully monitored those who used such exceptional abilities. Claiming that regulation is for the common good, the Governors now seek to curtail outstanding achievements by any cosmic citizen. WILD: Add or subtract two to your side’s attack total for every flare played by your opponent or his allies during this encounter. SUPER: Add one token to your sheet any time a Reinforcement is played. You have the power of Ignorance. Whenever you have no attack cards in your hand, you may use this power to draw a new hand (and have a second encounter as the offense if you won your first). During any regroup you may use this power to rearrange your ships among any of your colonies or home planets, even those home planets where you have no colony. You may use this power to play any of the following: reinforcements when not involved in the encounter; rifts and artifacts as any player and at any time before the reveal phase; kickers after encounter cards are played but before they are revealed. This alien power cannot be stolen, copied, or separated from your player color through any means. 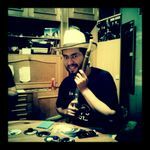 The Greenhorns are relative newcomers to the scene of Cosmic warfare. Feigning inexperience, they use their wiles to trick other races into allowing them to get away with everything in the book. Surely such room is all that is needed for these “newbies” to glide comfortably into universal dominance. 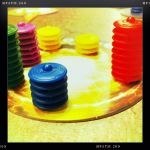 WILD: When making a deal, one or more sides may trade nothing at all, and/or a deal may be made in which one or more of the dealing players gain two colonies (subject to normal agreement). SUPER: As the offense, after destiny is drawn, you may choose any player who has a colony in the indicated system to become the defense. Have your encounter against one of his or her colonies in that system. You have the power of Three-Card Monte. As a main player, if you lose the encounter and have two or more cards in your hand, use this power at the end of the reveal phase. Take any two “distraction” cards from your hand and mix them facedown on the table together with your losing encounter card. Your opponent now points to one of these three facedown cards, which you turn faceup. If your opponent chooses your losing encounter card (or a copy of it), you still lose the encounter, but your opponent also gains a free colony anywhere in your system using up to four of his or her ships from colonies. If your opponent chooses a different card, you win the encounter instead, but all allies on both sides must immediately return to their other colonies. Afterwards, the two distraction cards return to your hand. You do not reveal the distraction card(s) that your opponent did not choose. Having confidence in their innate ability to distract and befuddle. The Grifters zig zag through the known, the unknown, and the known unknown Cosmos spotting their next mark before it suspects anything is amiss. WILD: When you lose an encounter, you may turn the two encounter cards face down in front of you. You now have 30 seconds to mix the two cards, keeping them face down on the table while mixing them. Your opponent must now identify your card by pointing to it. If the revealed card is not your card and it changes the outcome of the encounter to your favor, you win the encounter. SUPER: You may play four-card monte. You have the Power to Transmogrify. Whenever you lose an encounter as a main player or ally, you may use this power to force one player on the opposing side to draw an alien power at random and replace his or her current power. You may not transmogrify a player into an alien with Game Setup or alternate victory conditions. Twisted in mind and body, the Grotesque punish the abuses of power by means both hideous and harsh. The very nature of their victims is erased completely in favor of a new, radically different persona. Each change they cause twists the Grotesque themselves in a more unnatural way - but they have gone too far to stop now. WILD: You may change the recipient of a power effect to another player (if the effect is still legal). SUPER: You may choose to transmogrify any or all players opposing your side when you use your power. You have the power to Chaperone. Whenever your ships are in the same system of those as another player and either of you moves ships from that system to a planet, into an encounter, or to the warp, you may use this power to send up to an equal number of your ships from the same system to follow the other player's ships, or vice-versa. Ships that follow into an encounter automatically become allied on the same side as the followed ships, but do not count against the normal limit of four. This may cause a player to be allied with him- or herself, but this does not allow ships to follow (or join later) if this would cause them to be allied against their own side. The Guardians have taken it upon themselves to chaperone the lesser races of the Cosmos and keep them under a watchful eye. Distrustful species are often followed by the Guardians to see their aims, while others are “relocated” to places under Guardian control. Either way, these daunting aliens will not be taken by surprise. WILD: When you are not a main player, if one main player invites you to ally but not the other, you may use this flare to cause the main player who did not invite you to ally to lose a card at random from their hand. SUPER: As the defense, if you lose an encounter, you may cause your ships to remain on the targeted planet instead of going to the warp. Game Setup: Draw 3 cards from the unused flare deck and place them facedown on this sheet. You have the power to Channel. At any time, you may use this power to play a wild flare from this sheet as though it were in your hand. If the flare would return to your hand after use, then you must discard it in the regular discard pile. If you are Cosmic Zapped, replace the flare on this sheet. Cards played from this sheet do not count toward the normal limit of one flare per encounter. At the end of any player's turn, you may use this power to remove any or all remaining flares on this sheet from the game, then draw cards from the unused flare deck to place facedown on this sheet until you again have three. The Hosts' ability to channel the spiritual essence of past and future aliens allows them to manifest some of the defining characteristics of their alien occupants. After being channeled, some aliens decide the experience was so pleasant they will return to active public life, popping up here and there to affect galactic events. WILD: You may draw three cards from the unused flare deck and add them to your hand. Give this flare to the Host after use (or discard it, if the Host isn’t playing). SUPER: When replacing cards on your sheet at the end of a turn you may draw two additional cards. Choose from all drawn cards, placing them on your sheet, until you have three. The remaining cards are removed from the game. You have the power of Wilds. Whenever any player (including yourself) reveals an attack 08 in an encounter, use this power to treat is as wild. Cover one of the six numbers on this sheet with a token to change the attack into an attack card with that value. Once all six numbers have been covered, immediately uncover all of them. At the start of your turn, you may declare a different attack card number is wild. The Fun-loving Jokers enjoy humiliating the conceited, mocking the powers that be, and causing general chaos. They seek not to rule, but to satirize the universe. WILD: As a main player, you may change a revealed negotiate card into an attack 08. SUPER: When you use your power, you may move a token on a number onto a different number, instead of adding a token. You have the power of Clumsiness. Whenever you draw more than one card from the deck (including when you are dealt your initial hand), use this power to fumble and drop one or two of the drawn cards. Whenever you place more than one of your ships on the same planet, use this power to bump any one other ship off of an adjacent planet in the same system. Fumbled cards and ships go to the discard pile and the warp. WILD: For the rest of this encounter, each time another player should draw more than one card from the deck, you may deal out that player’s cards. Deal one faceup, deal one to the wrong opponent, or do both (with the same card or two different ones). SUPER: As the offense or an offensive ally, before encounter cards are revealed, you may examine your ships in the hyperspace gate, then drop them from one foot above the gate. 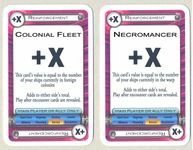 If any ships on your side of the encounter come to rest at least partly on the table, after cards are revealed the offense decides which ones return to the gate and which ones return to colonies.